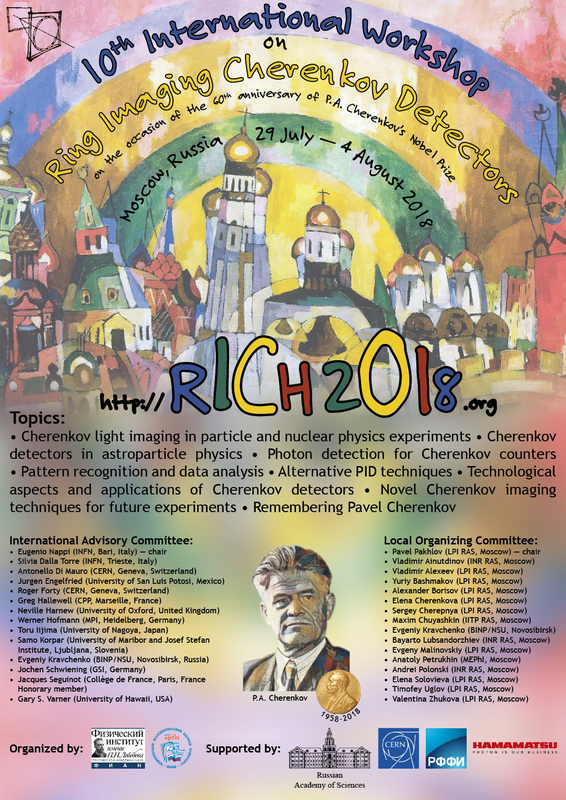 The 10th International Workshop on Ring Imaging Cherenkov Detectors (RICH 2018) will be held in Moscow, Russia, July 29 – August 4, 2018. An associated Industrial Exhibition will be organized during the days of the Conference (Monday – Friday, July 30 – August 3). Companies are invited to participate. The exhibition time are the five days of the Conference: July 30 – August 3, 2018. The location of the exhibition is close to the exits of the Conference Hall. During coffee breaks the coffee will be served close to this area. Sufficient time for visiting the exhibition without talks is foreseen. Fee for an exhibition area of 1.5×3 m2: 400 € per day (1600 € for the whole period). Equipment included: 2 chairs, 1 table, power connection, WLAN network. Registration of 1 person for the whole duration of the Conference including participation at all Conference sessions and social events (welcome reception, concert, Conference trip, and Conference dinner) is included. As only limited space is available the allocation is according to the sequence of registration. As a complement to the Industrial Exhibition, the Conference organizers offer alternative publicity opportunities. These include the possibility of placing flyers (or other promotional items, such as pens) in delegates’ bags; sponsors will be listed in the Conference program. Fee for a flyer in delegates’ bag: 800 €. For other material, you may wish to place in delegates’ bags, please contact us. For booking an exhibition area or joining other sponsorship program, please contact the organizing committee by e-mail. Upon receipt of your definite order the Conference office will send an invoice to your address. Full advance payment is required. Any changes and cancellations must be communicated in writing to the chairman of the organizing committee. Upon receipt of a written cancellation notice before July 1, 2018, 80% of the total fee will be refunded. No refund can be made for cancellation after this date. Any refunds will be made after the Conference.